Get ready! The Grinch is stealing Christmas this year at Universal’s Islands of Adventure at Grinchmas 2014! From December 6 to January 3, Universal’s Islands of Adventure will transform its Seuss Landing area into the whimsical world of Grinchmas. Be sure to explore every nook and cranny of this wintry wonderland, as it’s filled with special touches Dr. Seuss fans are sure to adore. 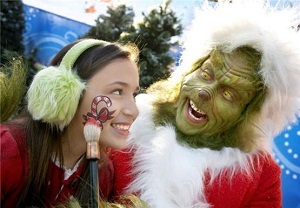 At Grinchmas 2014, you and your family will enjoy a live retelling of Dr. Seuss’s classic holiday tale starring the Grinch, as the Who’s from Who-ville come to life both onstage and off, strolling through Seuss landing sharing holiday cheer. And even though the Grinch is stealing Christmas, he’ll still have time to sign autographs, give furry handshakes and take photos, providing the perfect memento for folks who like to do the holidays a little different! Have you been to Grinchmas before? What’s your favorite part?